As if they knew you needed an end-of-week pick-me-up, Einstein Bros. just did your breakfast and lunch plans a solid by releasing six new limited-time sandwiches. Inspired by regional foods, all of them are exactly what your bagel dreams are made of. 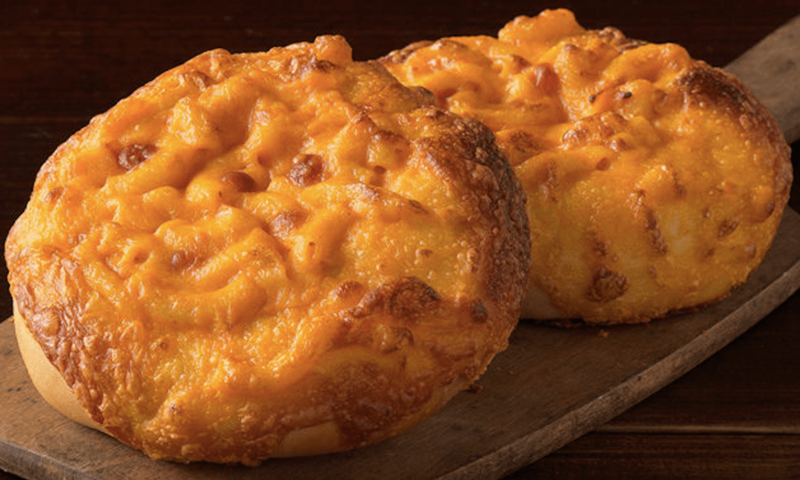 First, the headliner, which will stay on the menu indefinitely: A mac and cheese bagel made with Annie’s Organic Macaroni & Cheese cooked into a potato bagel then covered in seven cheeses, including a slice of cheddar. The schmear possibilities are endless. Get Mac & Cheesy with our new Midwest sandwiches! Our Cheesy Mac Breakfast sandwich comes on a Mac & Cheese Bagel featuring thick-cut bacon, cage-free eggs and cheddar cheese. Indulge a little later with our Cheesy Mac Lunch sandwich on a Mac & Cheese Bagel with ham and swiss cheese. Their Southern-inspired limited-time-only sandwiches are the Crispy Chicken & Tater breakfast and lunch sandwiches. Breakfast is a cheesy hash brown bagel with cage-free eggs, crispy chicken breast, cheddar cheese and Country Pepper Schmear. I could not think of a better use of Country Pepper Schmear if I tried. Lunch is a cheesy hash brown bagel with crispy chicken breast, cheddar cheese, lettuce, tomato, onion and mayo. Your favorite comfort foods are here with our new Southern sandwiches! Our new Crispy Chicken & Tater breakfast sandwich has all the fixins’ – Cheesy Hash Brown Bagel featuring crispy chicken breast, cage-free eggs, cheddar cheese and country pepper shmear. If you are hungering for more, try our new Crispy Chicken & Tater Lunch sandwich – Cheesy Hash Brown Bagel with crispy chicken breast and cheddar cheese. They also have Southwest breakfast and lunch sandwiches on green chili bagels. Breakfast is egg whites, turkey sausage, pepper jack cheese, tomatillo salsa and reduced-fat plain cream cheese. Lunch is turkey, bacon, pepper jack cheese, lettuce, tomato, onion and mayo. Spice it up with our new Southwest sandwiches! Our Green Chile Egg White breakfast sandwich comes on a Green Chile Bagel with turkey sausage, egg whites, pepper jack cheese, tomatillo salsa and reduced fat plain shmear. Give our new Green Chile Club lunch sandwich a try – Green Chile Bagel featuring turkey, thick-cut bacon, and pepper jack cheese. The new menu items are part of their Flavors Across America series and the sandwiches can be found at participating locations starting today.